I met Gilles Lancelot about a dozen years ago shortly after he had purchased the old Mumm property in the center of Cramant. It was January, I think, and he had not yet hooked up the heat in the large tasting room that overlooks the vineyards of Cramant and Avize. As we spoke, we could see each other’s breath from across the table. Gilles heated up some leftovers in the back room after we had tast­ed, which at least provided some warmth to the room. It didn’t bother me that I was sitting indoors with my winter coat on: the champagne was stellar and that gave me all the warmth I needed. Representing the fourth generation, Gilles Lancelot trained at the champagne school in Avize and farms 8.3 hectares (just over 20 acres) of grapes, half of which are in Cra­mant, Chouilly and Avize with the other half spread over Boursault, Mancy and Monthelon in the Vallée de la Marne. 80,000 bottles are produced annually and no grapes are sold to négociants. About 50% of his production is exported. Gilles is a grower that makes a full range of champagnes, but we focus on his Blanc de Blancs cuvées which we feel represent some of the best values in champagne: Fresh and elegant, lightly dosed and superbly creamy, these are perfect aperitif champagnes. 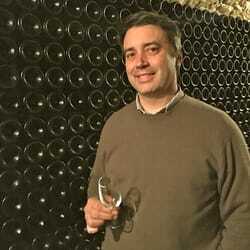 Gilles has run the estate since 2005 with his wife Céline Perceval, with whom he has four kids. The roots of the domaine stretch back to the early 1900s when Jean-Baptiste Lance­lot farmed land in Cramant but also worked as chief winemaker for Mumm. In the 1960s one of his grandsons married Brigitte Pienne from Chouilly who merged her inheritance with her husbands and the two estates merged, becoming A. Lancelot-Pienne in 1967. Their vines now average 40 years of age. The vineyards are worked lutte raisonée, that is sustainably, so that spraying and chemical treatments are reduced to the absolute mini­mum. In the winery, the grapes are given a very slow pressing, then fermented in stainless steel and enamel-lined concrete tanks where they remain on their fine lees for six to eight months. Malo­lactic fermen­tation is done on all wines. All of the cham­pagnes are aged for at least 30 months en ti­rage. Dosage is between 7 and 8 grams depending upon the year. 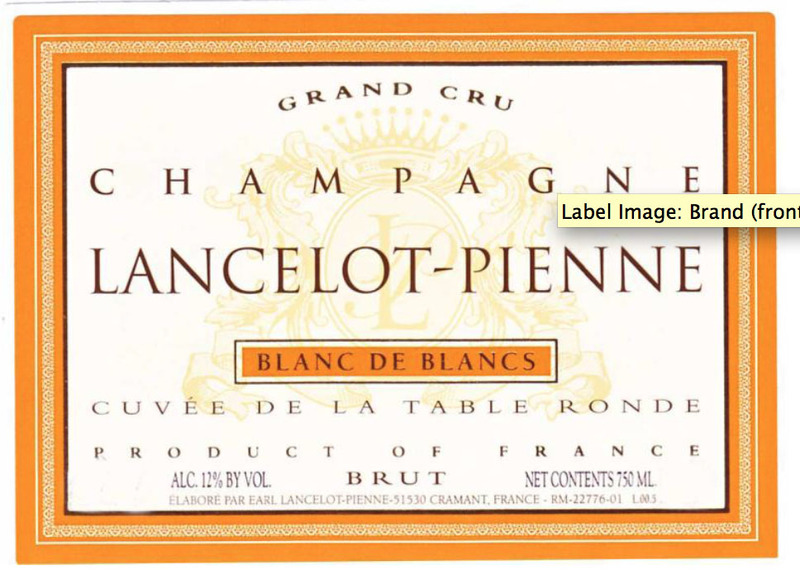 The Blanc de Blancs NV (with the green border on the label) is made mainly from grand cru plots on the Côte des Blancs but sometimes supplemented with Chardonnay from their vineyards near Cuis. It is made with 80% of the base year, (currently 2012) the rest from a type of reserve solera that incorporates 17 different vintages. It is strikingly pure and crystalline, adorned with a beautiful lace of fine bubbles. The nose is fine and floral, with predominant notes of white fruits and chalk. The palate reveals creamy yet crisp flavors of pear, apple and fresh almonds with a beautifully fresh fin­ish. This is ideal to accompany appetizers or seafood. Cuvée de la Table Ronde (with the orange border on the label) is made with grapes from Cramant, Avize and Chouilly, using 80% from the base year (here 2010) with 20% solera of reserve wines that range up to 19 years old. Dosage is 6 grams per liter. The intensity and concentration of aromas are bal­anced by the silky elegance of the mousse and its very fine structure. This champagne offers a spectrum of aromas including quince, brioche, peach, white flower and a hint of raspberry that dance upon layers of chalky minerality. This cuvée is taken from premier and grand cru vineyards. It is composed of 50% Pinot Meunier, 35% Chardonnay, and 15% Pinot Noir. The fruit is hand harvested and aging takes place in temperature-controlled stainless steel tanks. The wine spends a total of five years in cuvée and bottle before its final disgourgement. 20% reserve wine is used to insure regularity. Nose of freshly baked pie crust, spice, caramel apple and notes of tobacco; similar flavors with vanilla and pear; rich and creamy. 1996 Grand CruMade with 100% Chardonnay from old vines selected from the commune of Cramant. Disgourged in 2004 Plenty of fine bubbles, giving off brilliant aromas of white flowers, exotic fruit and citrus fruits. Very open for a 1996 but with good underlying acidity.